MagDiSoft Web Solutions Office No. 102, Bramha Majestic, NIBM Road Kondhwa, Pune -411048 Tel: 808-769-4605 / 814-921-0979 www.magdisoft. 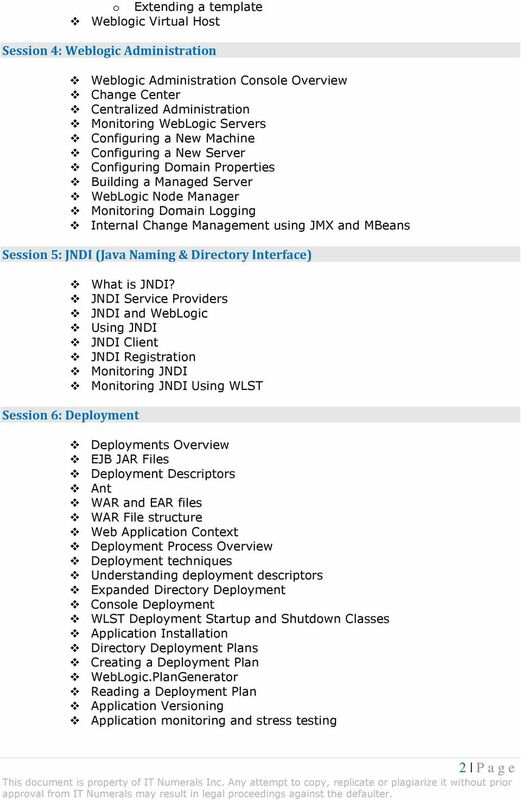 This training is targeted at System Administrators and developers wanting to understand more about administering a WebLogic instance. 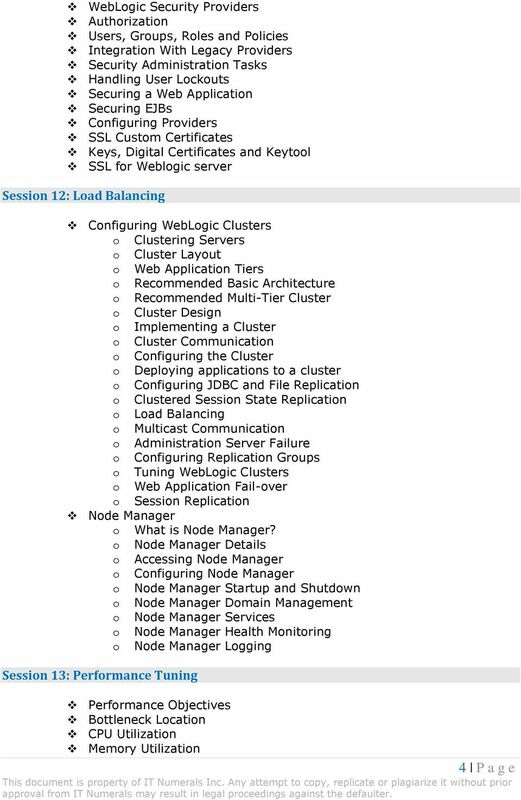 1Z0-102 Oracle Weblogic Server 11g: System Administration I Version: Demo Page 1. Which two statements are true about java EE shared libraries? A. A shared library cannot bedeployed to a cluster. Oracle WebLogic Foundation of Oracle Fusion Middleware. Lawrence Manickam Toyork Systems Inc www.toyork.com http://ca.linkedin. 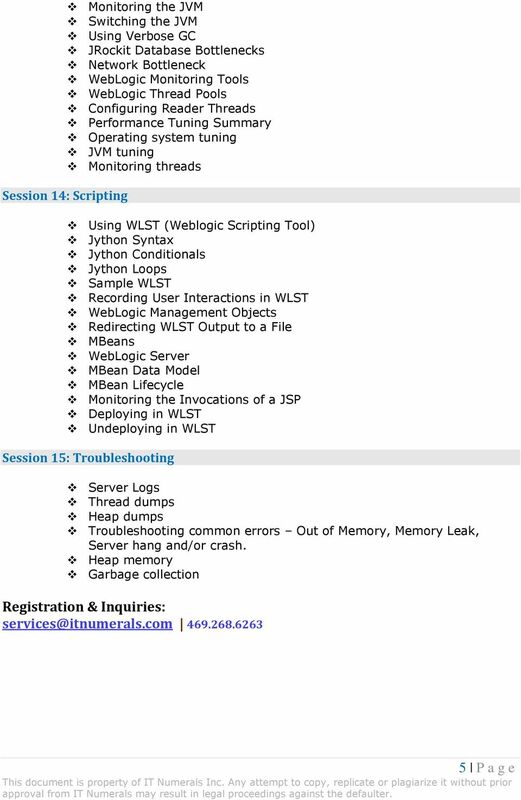 IBM WebSphere Administration 8.5 Course ID: Page 1 Last Updated 12/15/2014 WebSphere Administration 8.5 Course Overview: This 5 Day course will cover the administration and configuration of WebSphere 8.5. Weblogic Server Administration Top Ten Concepts Mrityunjay Kant, AST Corporation Scott Brinker, College of American Pathologist Specialized. Recognized. Preferred. The right partner makes all the difference. Sample copy. 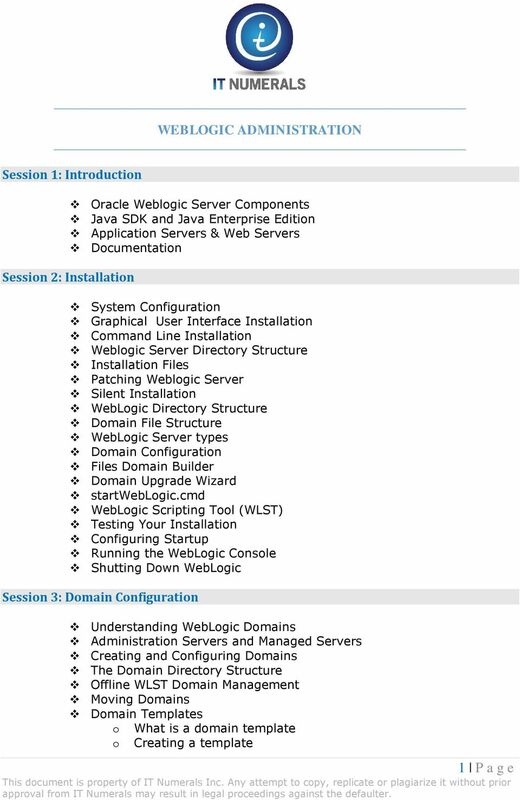 Introduction To WebLogic Server Property of Web 10.3 Age Solutions Inc.
JBoss AS Administration Console User Guide 1 by Shelly McGowan and Ian Springer Preface... v 1. We Need Feedback!... v 1. Overview... 1 2. Accessing the Console... 3 3. User Interface Overview... 5 4. Tuning WebSphere Application Server ND 7.0. Royal Cyber Inc.
Management. Oracle Fusion Middleware. 11 g Architecture and. Oracle Press ORACLE. Stephen Lee Gangadhar Konduri. Mc Grauu Hill. Maximum Availability Architecture. Oracle Best Practices For High Availability. 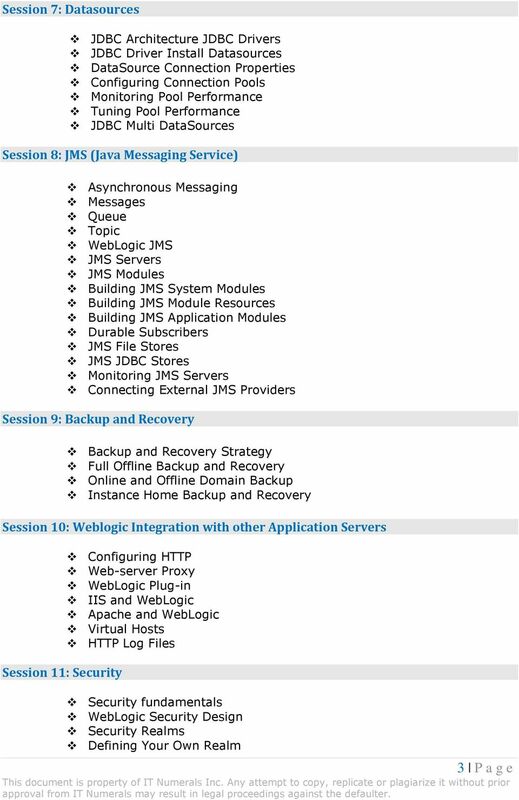 Backup and Recovery Scenarios for Oracle WebLogic Server: 10. EVALUATION ONLY. WA2088 WebSphere Application Server 8.5 Administration on Windows. Student Labs. Web Age Solutions Inc.
Enterprise Content Management System Monitor. How to deploy the JMX monitor application in WebSphere ND clustered environments. Revision 1.